Even if it wasnt catastrophically broken, HAWX 2 would be a hard game to get particularly excited about. HAWX 2 takes combat flight sim realism to a whole new level. Last night, while battling helicopter gunships over insurgent-held oil platforms in the Persian Gulf, I managed to crash four times, writing off four very expensive jets in the process. This morning, when I went to fly the next campaign sortie, I discovered I'd been grounded. There was no cutscene or message – the game simply refused to start. Clever Ubisoft have obviously included a secret Sim Squadron Leaderô feature that punishes profligacy with periods of forced heel-cooling. Brilliant! The other possibility, that they've shipped a game with a bug the size of a B-52 bomber, is far too implausible to contemplate. The sort of people willing to believe that are the sort of people likely to regard HAWX 2's demand for a permanent internet connection as a pain in the arse, when in actual fact it's just a way of 'empowering' us and providing 'added value that will facilitate and enrich the gaming experience'. Because my gaming experience has been both facilitated and enriched, I can only tell you about the first third of the campaign. 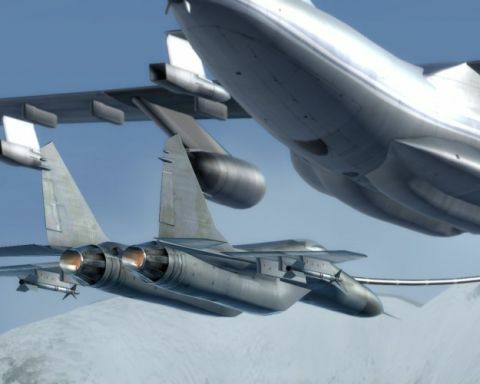 Missions one to seven suggest the Romanian devs have listened to criticism of the first HAWX (PCG UK 200, 66%), but still don't fully understand what makes light flight titles soar and satisfy. Just as in instalment one, the banditbattering is bland, and the plot framing it flimsier than a wood nymph's negligee. Tired of fighting the West with guerilla tactics, insurgents are now insurging openly with conventional weapons such as jets and frigates. In the guise of various vacuous military pilots, it's up to us to vanguard the counter-insurgency. Most of the time this means tearing around the sky spewing missiles at red squares (and, on one occasion, Red Square).Occasionally, you get to do something a little less manic, like refuelling on the wing, landing, guiding a UAV, or directing a gunship's gatling gun at vehicles in a sleeping Middle Eastern town. How fantastic you find all this depends largely on how many flight games you've played in the past and how satisfying you find pressing fire when a target icon changes colour. If you've tasted the aerial ambrosia that is Crimson Skies, Wings of Prey, or Red Baron, it's all going to seem decidedly second-rate. Those titles made their sky duels feel more meaningful or murderous; realism or imagination always kept unflattering FPS comparisons at bay. It's quite possible that the co-op campaigning, adversarial multiplayer and solo survival mode partially excuse HAWX 2's limp story and repetitive bogey bashing. Unfortunately, until that martinet of a Sim Squadron Leaderô forgives me for trashing four of his finest flying machines, I've no way of knowing.